A mouth guard is a custom fitted device that is flexible and worn over the teeth during certain types of sporting activities but they are also very popular for those who have trouble with gritting or grinding their teeth at night during sleep. The perfect mouth guard will be able to be fitted to your mouth for a more comfortable fit that feels secure. Our pick, Professional Dental Guard – Pack Of 4, contains 4 guards in two different sizes so you can get a fit that feels secure, even overnight while sleeping. Mouth guards are used for many different reasons. Having a good quality, well-fitting mouth guard can protect the teeth, lips, and tongue from damage and provides a barrier between teeth and these soft tissues. Many people with braces will wear mouth guards to prevent the braces from tearing up the lips and tongue. Whatever your reasons are for wanting a mouth guard, it helps to have prior knowledge about these devices before you start shopping around for one. There are many different types and styles on the market to choose from. The right knowledge can assure you of choosing the right type so you aren’t wasting your money on a substandard product. This guide will provide you with this knowledge so the research and purchasing process is not overwhelming. You will be able to sort through the different types of mouth guards with confidence and make an informed decision that will work for your needs. If you grind your teeth at night you may experience sore jaws, headaches and even damaged lips or tongue when you wake up in the morning. If you want relief from this unconscious habit, take a look at these Dental Duty mouth guards. This unique mouth guard molds to the shape of the wearer’s mouth which allows them to fit snugly and securely on both the lower and upper teeth. Shaping the mouth guard to your mouth is super simple. Just place the guard in boiling water, let it cool a bit and then press it against your teeth until the guard is tight-fitting and secure. The slim design of this night mouth guard allows for much easier speech than other types do. These mouth guards are BPA-free as well for your peace of mind and safety. There are four teeth guards in each package that include two different sizes. These different sizes along with the ability to change the shape with boiling water make it easy for you to find the fit you’re looking for. These mouth guards help relax your jaw muscles and prevent grinding and clenching. They csn be cut down to fit mouths of all sizes. There is a frenulum notch for comfort and you will be able to re-mold them if you don’t get the size right the first time. 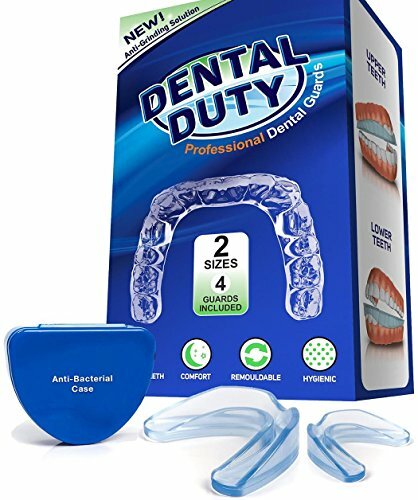 These Dental Duty mouth guards can also be used as teeth whitening trays and mouth guards for sports activities as well. It comes with an anti-bacterial case that keeps the guards clean and makes traveling super convenient. Just slip the case into your purse or bag and you are ready to go. 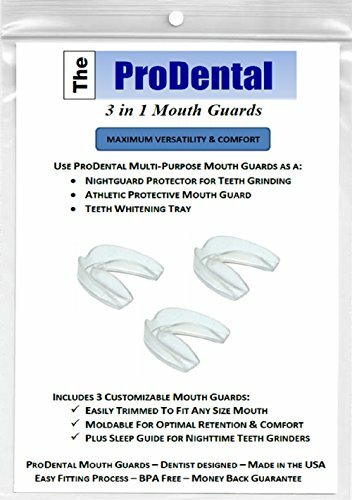 ProDental mouth guards provide you with professional level design and are the only mouth guard available that has support directly from a dentist. There are three mouth guards in this pack that can be adjusted to fit your mouth perfectly. These guards are made from FDA-approved, polyvinyl material that is long lasting, soft, odor and taste free, and hygienic as too. In addition to their main use of helping eliminate teeth grinding or gritting, they are also used for sports activities and as teeth whitening trays. These mouth guards from ProDental are BPA and latex free. The company offers free lab support as well as email and phone support from a real dentist that they keep on staff. The ProDental guards are meant to last, using a thick and durable 3mm base that provides plenty of cushion and shock absorbing capabilities. These mouth guards “lock”securely in place and can be worn even while sleeping. These mouth guards come with a 30 day “Better than Money Back Guarantee” that allows you to try the guards for a full 30 days. If you don’t like how they work for you, they will give you your money back, no questions asked. If you have had it with mouth guards that don’t fit, you have to take a look at DentalCare Labs moldable dental night guards. This mouth guard set contains 4 moldable guards that come in two sizes. Trim them easily to fit any size mouth shape so you have a perfect fit. No need to worry about having to have perfectly aligned teeth for them to fit right. These mouth guards can be custom fitted to any size teeth with any type of alignment. 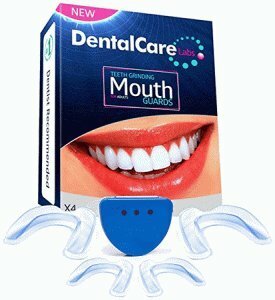 Wearing these DentalCare mouth guards is easy and very comfortable so you forget all about teeth grinding or clenching. Wearing these quality, moldable mouth guards will help relax your jaw muscles so you can wake up without jaw pain, teeth pain or headaches. They can be worn by men and women and can even be worn by children as well. The DentalCare mouth guards are made from high quality materials that are latex and BPA free. When not in use keep the mouth guards in the included anti-bacterial case so they stay clean and hygienic. This also makes it very easy to take them with you on trips or when traveling for business. Satisfaction is this company’s top priority. They provide customers with a no questions asked replacement policy and money back guarantee. Mouth guards are popular devices that are used for a number of reasons including certain sports activities as well as for night time problems such as teeth grinding, clenching and they are even used to help stop snoring. There are many different types of mouth guards on the market for you to choose from. We have featured three top rated choices above that are from reputable companies that are dedicated to providing consumers with high quality, moldable mouth guards that can be cut to fit any size mouth comfortably and securely. If none of these top rated choices are what you are looking for, you will be able to get m ore information on mouth guards by reading the buyer’s guide below. This information is designed to provide you with the education you need to sort through all these choices and decide on the right mouth guard for your needs. There are several features that you will find in a quality mouth guard. These qualities ensure that you spend your money on the right mouth guard for the job. We’ve listed these qualities below. Provides a high level of comfort and precise fit. There are many advantages to wearing a quality mouth guard. They can be crucial in preventing broken and chipped teeth, tooth loss and damage to the bone and root of the teeth when participating in certain sports activities. They are also beneficial for those who suffer from teeth grinding and clenching during sleep. There are three main types of mouth guards on the market. Each one is best suited for specific jobs. We’ve listed each type below along with some information about them. Stock mouth guard – These preformed mouth guards come all ready to wear and are not able to be adjusted. They are inexpensive and easy to find in most stores. This type of mouth guard is often used when participating in sports. The drawbacks to using stock mouth guards are that they don’t allow for differences in mouth or teeth size and can be bulky and uncomfortable to wear.Stock mouth guards are not recommended by dentists for those who clench their teeth or grind them. Boil and Bite Mouth Guard – These mouth guards provide a much better fit than stock mouth guards. They are much more adjustable and are made from thermoplastic material that is boiled to soften and then placed into your mouth and shaped around the teeth so the fit is much more customized. Custom Fitted Mouth Guard – These are the best kind of mouth guard you can get, albeit the most expensive as well. These mouth guards are usually designed by your dentist and will fit your mouth perfectly. If you will be using the mouth guard on a regular basis, look for mouth guards that can be fitted by a dentist or over the counter varieties that can be adjusted and cut down to fit perfectly. There are many different variations in material, thickness and what they will be used for. We have listed the different variations of mouth guards below. Severe Bruxism – (Jaw clenching or grinding) – If you suffer from heavy grinding or clenching you want to choose the thickest and strongest mouth guard on the market. Guards that are designed for severe bruxism will last anywhere from 2-5 years with proper care. They are made from 2 to 3 mm rigid acrylic. These are the most expensive of all the kinds of mouth guards but they are the best way to thoroughly protect the teeth when you have a severe case of grinding or gritting your teeth and will prevent damage to the teeth and jaw and head pain. Moderate Bruxism – A hybrid mouth guard is a good choice if you have moderate teeth grinding and clenching. The thickness of these guards is between 2-3mm. They typically last from 1 to 3 years. The inside layer of a moderate mouth guard is soft so it provides cushioning for those who grind and grit their teeth. The outer layer is made of rigid plastic and provides plenty of durability and tooth enamel protection. Light Bruxism – If you have a very light case of jaw clenching or grinding, you can probably get away with a light Bruxism mouth guard. This type of mouth guard features soft rubber to protect the teeth from damage. Lightweight mouth guards usually last from 6 months to two years before they have to be replaced. Daytime Bruxism – Not everyone who suffers from this condition has it at night. If you clench and grind your teeth during the day, try a daytime mouth guard that is thin, barely noticeable and lightweight as well. These guards are made of 1 1/2mm thick acrylic. They are flexible enough to allow for easy speech while still providing plenty of protection. These daytime mouth guards will usually last 6 months to two years. It is important to make sure that the mouth guard you choose either fits properly out of the box or that it can be cut and molded to fit perfectly. We’ve listed the steps involved in fitting a mouth guard properly. Step 3 – Drop the mouth guard into the hot water for a total of 10 seconds and then take it out. Step 5 – Remove the mouth guard once you have bitten down and held the guard in your mouth for the 20 seconds. Drop the guard into the ice water for two minutes which will set the mouth guard’s shape. Having healthy teeth and getting good sleep is good for your overall well being. If you suffer from bruxism (jaw clenching and teeth grinding your teeth) your teeth are at risk of pain and erosion. Dentists may tell you to get mouth guards for many reasons. It is important to purchase high quality mouth guards that will hold their shape and last a good, long time. You can save money and time by purchasing them online rather than from a doctor. Grinding your teeth and clenching them can not only cause disrupted sleep, it can cause jaw pain. Headaches, tooth damage and more. Having the right mouth guard will reduce the chances of these things from happening. The information in this guide will help you choose the right style, kind and brand of mouth guard. Take a look at the three choices reviewed above. All three are from popular companies that understand the importance of quality. All three of them can be customized to fit your teeth perfectly.